I believe I have encountered every definition of kink at least once in the past 4 months. How we deal with these bumps in the road are the real lessons of life and one of the most important gifts we can give our children. We teachers are settling into our roles, the children are settling into and experimenting with friendships and our sense of place is beginning to arrive in our garden. Systems are developing and patterns are attempting to be established. Yet we are still new. As much as I want to have it all figured out it just isn’t. So with a bit of the newness comes chaos, uncertainty, and most importantly growth on many levels. Thank you for growing, it can be hard work and it is delightful to be growing with all of you and your lovely children! May the new year bring us all much prosperity and happiness. Thanks for the highs and lows but mostly for the inbetweens. 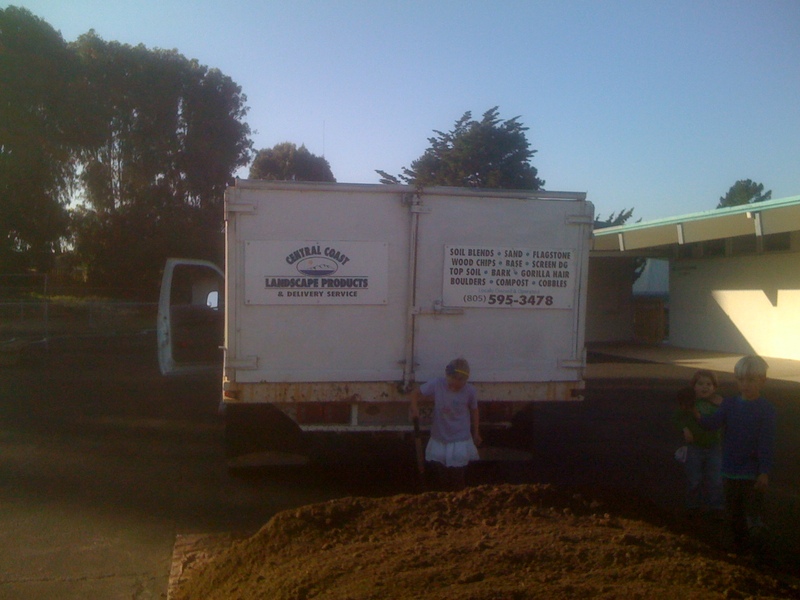 Thank you to Mia and Evan, Hunter’s parents, for getting soil donated for our garden beds. 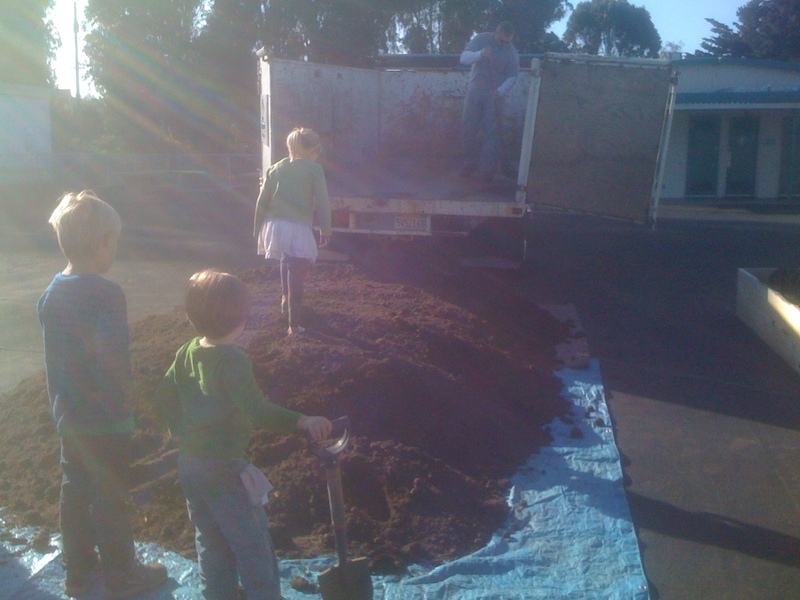 Central Coast Landscape Products donated 4 yards of wonderful soil so we now have dirt in our garden beds! Thank you for this amazing gift! Let’s grow! Mia and Evan also donated our filtered drinking water system and installed it in our classroom. This was done back in September and I’m not sure if I ever said thank you to them. So thank you. I look forward to drinking our water each and every day as do our children. Thank you to David and Heather, August’s parents who hauled in many stumps and built our new digging area. Everybody needs to dig! Thank you to Sarah and Pete, Eli’s parents for donating two new shovels with which to dig. Alright let’s dig our heels in now and get to work! Thank you to Anna and Gareth, Rowan’s parents who bestowed the gift of chanterelle mushrooms and swiss chard to all of our tummies. Thank you to Gretchen and Chris, Charlie’s parents who donated our worm bin composter. This worm bin came from Gretchen’s neighbor and friend, Carla, who recently passed. She loved gardening and loved children, so her spirit lives on in our garden. We will be having a parent evening on Jan. 25th at 7pm, this Wednesday night. We hope you can make it for another fun evening. Our topic will be on establishing healthy boundaries for your child. Tuesday Feb. 14th. I am not quite sure yet what time this will be exactly, but morningish. I’ll let you know. If you would like to give Valentine cards to the other children, we ask that you make your own, or if you buy them please stay away from commercialized/characterized ones. We have a large group. If you want to participate in a Valentine exchange, please make 24 Valentine’s. We will not have school Feb 20-23rd. This is a teacher development week and I will be attending two teacher’s conferences. I’ll let you know all about them when I return. School resumes Feb. 27. If you have enrollment contracts or other state paperwork to turn in please put them in the basket on top of the cubbies. If you would like to have your child stay late please write a note to me and we can arrange it. Aftercare is from 1-4pm, T-Th, at $5/hour. 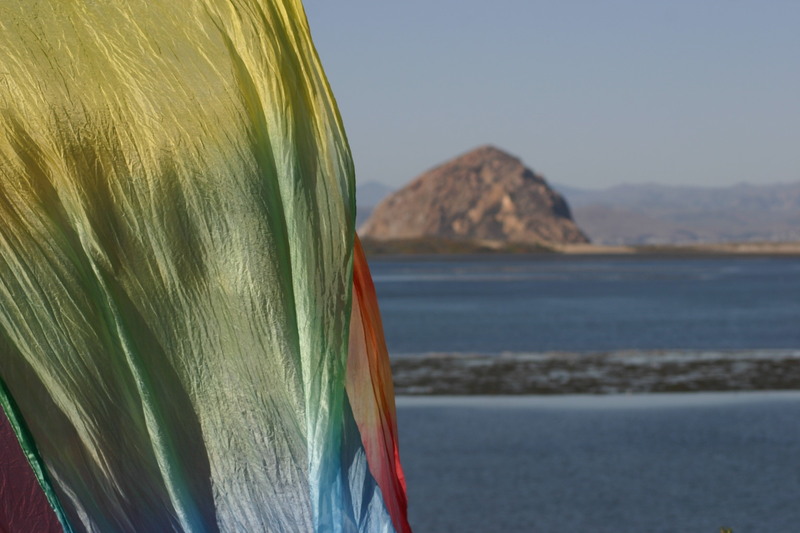 Waldorf Early Childhood Association of North America is an organization that works with Waldorf schools and initiatives. I am currently in the process of becoming a “developing member” of WECAN. This will basically put us on the Waldorf map and offer us support in the way of mentoring, book discounts, an annual subscription to their magazine “Gateways,” news, conferences, etc. This is an important step in the growth of our school and I am excited to be doing it. Monique and Steve Klosterman have Pete (5) and Iris (1). Tammy and Ryan Hubbard have Hazel (3). And from Big Sur Charter, Georgia (Renee and Kurt) is now joining the 1st graders and Sidda (Heather and her husband whose name escapes me right now) is joining the kindergarten on Tuesdays, as well as Thursdays. I hope to see many of you on Wednesday night for our parent evening at 7pm. Have a great week!